Electric delivery trucks cut costs, reduce greenhouse gas emissions, and reduce noise pollution. FritoLay is adding more electric trucks to its delivery fleet, with a 20 truck deployment announced today to its fleet in upstate New York. With these trucks, New York will be home to 35 Frito-Lay all-electric trucks, the company's second largest deployment in any state. The new electric delivery trucks are coming with new highly automated charging stations. FritoLay is the first commercial test customer of these stations, that will not only improve how the Frito-Lay fleet is utilized but also pass information to the state to help regulators understand how electric fleet trucks are used. The new trucks will operate from distribution centers in Albany, Buffalo, Rochester and New Paltz. "The introduction of these enhanced charging stations is a significant step forward for the Frito-Lay fleet as we continue on our sustainability journey," noted Mike O'Connell, senior director of fleet operations for Frito-Lay North America. "Not only will the stations benefit our operations in real-time, they also allow the state of New York to gain a better understanding of the vehicles, providing the critical information needed for the state to continue to invest in this alternative vehicle technology." Frito-Lay received funding through Governor Andrew M. Cuomo's Charge NY initiative, which seeks to grow electric vehicle use in the state by helping to create a statewide charging station infrastructure. "Through Charge NY and the Truck Voucher Incentive Program, Governor Cuomo has encouraged the purchase and use of electric vehicles in New York State," said Janet Joseph, vice president for technology and strategic planning at NYSERDA. "NYSERDA is pleased to see Frito-Lay leading the way to a more sustainable method of transportation, through its investment in technology that can lower its operating expenses, reduce its fossil fuel consumption and promote sustainable transportation." Electric delivery trucks eliminate both fossil fuel use and greenhouse gas emissions. FritoLay's initial 15 trucks in New York have eliminated the need for an estimated 27,000 gallons of fuel and 449,550 pounds of greenhouse gases. The 35 truck fleet will eliminate 63,000 gallons of fuel and nearly 1,048,950 pounds of greenhouse gases annually. 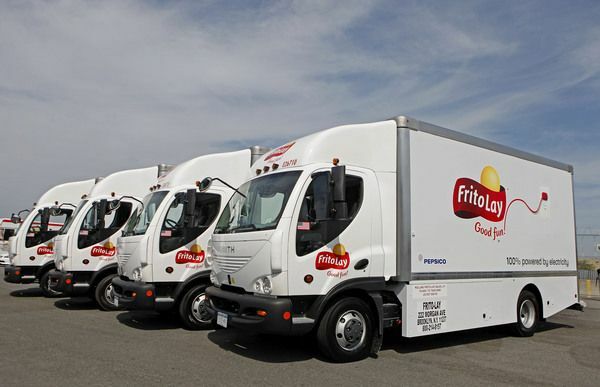 Nation-wide FritoLay is moving towards 269 electric trucks deployed in the U.S. That makes FritoLay's fleet the largest commercial fleet of all-electric trucks in the country. The full fleet should eliminate the need for an estimated 600,000 gallons of fuel annually.